후지산, 일본의 마운트 후지 호스텔 마이클스 | 호스텔월드에서 예약하세요. 100% of the balance due of your first night will be charged if you do not notify us about your cancellation by 3 days before your scheduled arrival date or you are a No Show on your scheduled arrival date. Group Bookings apply to Mix Dorm Rooms Only. Mt. 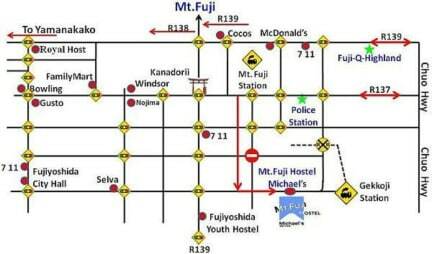 Fuji 마이켈즈는 2010년 7월 17일에 오픈한 호스텔입니다. 후지요시다역(富士吉田)에서 도보 15분 겟코우지(月江寺)도보 5분, 후지요시다역에서 택시로도 760엔 오실 수 있습니다. 영어가 유창한 스탭이 관광, 등산, 낚시등 안내합니다. 저희 호스텔은 전관금연입니다. 무선랜은 무료입니다. 자요롭게 스카이프를 이용하세요.